The Gowanus Lounge: A Green Roof for Gowanus Whole Foods? A Green Roof for Gowanus Whole Foods? We've had our share of fun with the Gowanus Whole Foods, especially when dwelling on the irony of the environmental condition of the site on which the store will rise. But, how about a green roof for it? Seriously. It's a great idea and there's a new Green Roof Whole Foods Market blog pushing the proposal. It is a much more compelling idea than the retailer's plan to put parking on the roof (in addition to a 480-car parking garage on the site). The green roof would save energy, be good for birds and butterflies and help reduce the flow of garbage from storm sewers into the canal. (Blacktop is a major contributor to increasing storm runoff and hence a major source of pollution in the Gowanus.) Green also fits with visions of Gowanus' future. The Gowanus Canal Community Development Corporation emphasizes green industry and environmentally-friendly buildings. Marni Horwitz and Madalyn Warren, who have developed the proposal, write that "with the support of the immediate communites effected by Whole Foods Markets and the greater Brooklyn area, Whole Foods will be receptive to Brooklyn's specific environmental concerns and to green roof design." Here's hoping they're right. also useful would be porous paving for the parking lot - easy to do for parking, and though you still have to dump the stormwater somewhere once it filters through the paving, the peaks are flattened out a bit and its cleaner than it would be just running off the site. i wonder if whole foods considered the porous paving for their parking lot? 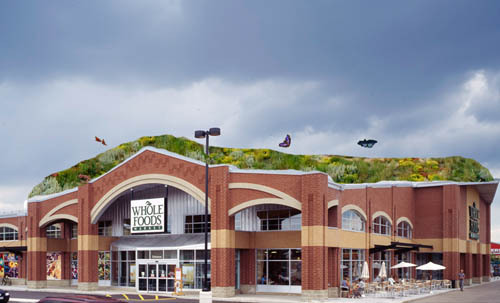 at the moment, whole foods's pr company Yoswein is saying that a green roof is not an option, but i really wonder if the building experts advising the construction end are aware of all of the new and improved sustainable building materials and technology available these days. Interesting Brooklyn Factoid: Condo Glut?